The show comes to grand finale with nice versions of “The Man In Me,” “Tomorrow Is A Long Time” and especially “Knockin’ On Heaven’s Door,” using the flute set to a reggae beat. The set ends with “Forever Young” and “The Times They Are A-Changin’.” It is a very good, but not classic, performance. They are still trying to learn the new arrangements and have not yet introduced any new songs to the set. Thank you. This is a song I wrote for a friend of mine a few years back. Thank you. Very nice to be here in this country. Thank you. We’re getting to learn that one. I wanna introduce you to some of the people up here. I bet you’ve been wondering who they are. Playing the horns tonight we have Steve Douglas. On the violin and the mandolin David Mansfield. These three young ladies at the back, on the left, far left is Helena Springs. In the middle is my ex-wife Jo Ann Harris. Debbie Franklin, on the left. On rhythm guitar we have Steve Soles tonight. On the bass guitar Rob Stoner. On the drums Ian Wallace from Great Britain. Lead guitar Billy Cross. On the organ Alan Pasqua, on the conga drums Bobbye Hall. We’re gonna leave you with this tune. It’s been a pleasure singing here. Thank you very much. We’re gonna be leaving town in about three days, but we’ll be back, and we’ll see you then. 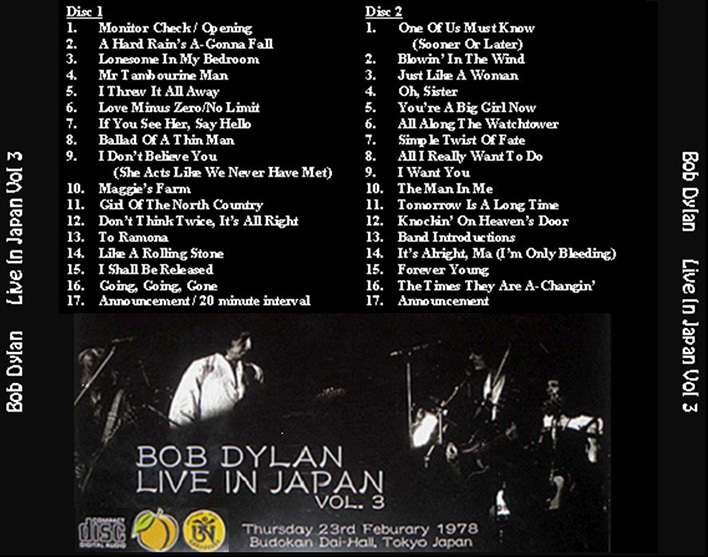 So, a bootleg covering the worst part of one of Bob Dylan’s worst tours? Some fans will love it, so it’s all good. 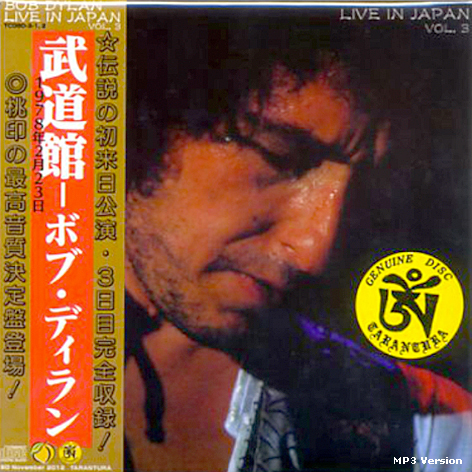 Even I like a couple things off the official “Budokan” album. Although 1978 isn’t a celebrated year in rock and roll, Neil Young, Van Morrison, the Stones and Lou Reed all contributed something. My favorite 1978 Dylan performance is a version of “Something There is About You.” The recording’s fidelity is abysmal, but its arrangement is so beautiful, so ethereal, you’ll feel like you’ve dipped your toe in the spirit world.